A cherished dog has been shot dead in its family’s garden in the one of the most shocking episodes of gun crime targeting pets. Lola the Chihuahua was found in a pool of blood after being gunned down just yards away from where her owner’s children were unpacking from a family trip. Today Lola’s owner said her family had been left devastated by the despicable targeting of the five year old pet. Suzzanna Day found Lola slumped in the garden of her home in the St Paul’s Road area of Islington, London, on Wednesday afternoon moment after letting her out to go to the toilet, fearing at first the pet had been attacked by another animal. The mother of three, who is now frightened of letting her children — aged aged 11, nine and two — play outside, explained: “Lola wanted a wee so I let her out in the garden. I took a bag upstairs to my bedroom and when I came back down I went out to call her back in. She was just laying there in a pool of blood. “I was freaking out and screaming. My brother, who lives just around the corner, raced around. He rushed her to the vet. “We’re all absolutely devastated. She was one of my babies. I’m in complete shock. The children saw her lying there so they’re really upset. 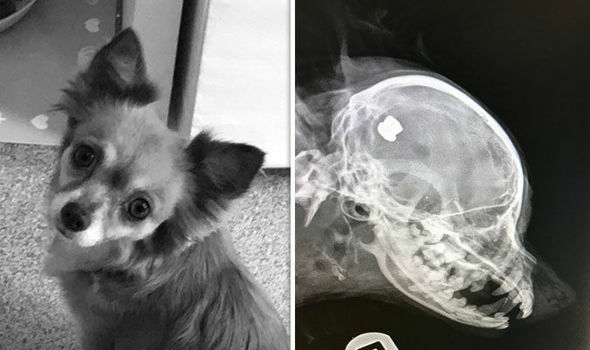 X-rays have revealed how Lola was shot in the head with an airgun, the shocking images showing a tell-tale pellet was left embedded in her skull. The incident has been reported to both the police and the RSPCA. RSPCA animal welfare officer (AWO) Siobhan Trinnaman, who is investigating the killing, said: “This is utterly heartbreaking for Lola and her family. Earlier this year, the RSPCA launched a call for mandatory licensing of airguns in England and Wales, with the charity making the recommendation part of its submission to the Government’s current review of regulation of air weapons following serious incidents involving children.